-It improves digestion and appetite. -It helps to make spinal cord strong and flexible. -Cures the symptoms of menopause. 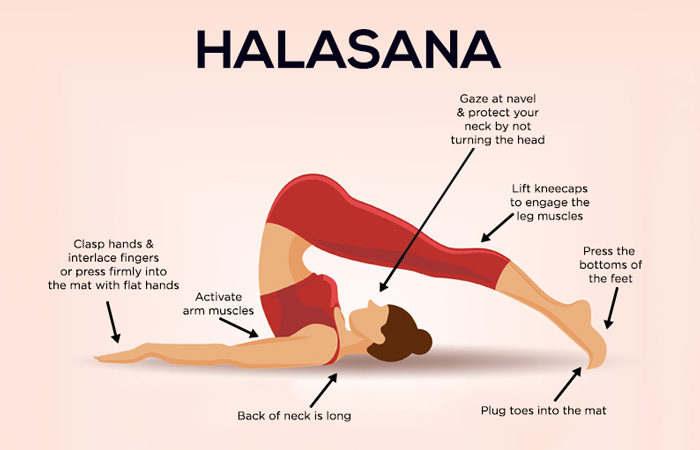 -Halasana also makes facial skin healthy by improving blood flow the nerves present underneath you face. -It helps to reduce stress. -It normalizes blood-glucose level and stimulates the internal organs. -It stimulates the reproductive organs. -Beneficial for diabetic people. Those people should do this regularly. 1. First of all lie down flat on your back, keep your arms placed beside your body and your palms facing downwards. 2. Relax you body & then take a breath and lift your feet off the ground using your abdominal muscles. Your legs should be at a 90-degree angle. 3. Then lift your palms to support your hips to lift them off the floor. 4. After this, try to touch your both the feet to the ground behind your head. 5. Make sure your back is perpendicular to the ground. 6. Hold the position for a minute while focusing on your breathing. Exhale slowly and gently bring down your legs. Avoid jerking your legs while releasing the pose. Repeat this pose for 3-5 times.